MALI - Tombouctou - L'incendie de l'Institut Ahmed Baba, qui abrite à Tombouctou des milliers de précieux manuscrits datant pour certains du XIIe siècle, suscite une émotion considérable au Mali et au-delà. Selon des témoignages, dont celui du maire de Tombouctou qui n'était pas dans sa ville au moment des faits, des rebelles djihadistes en fuite ont délibérément mis le feu à la bibliothèque de cette ville mythique du nord du Mali. Tombouctou, "découverte" en 1828 par l'explorateur français René Caillié, est classée au patrimoine mondial de l'Unesco. Ses manuscrits sont "uniques en ce qui concerne leur valeur et témoignent d'une longue tradition d'enseignement et d'échanges culturels", a souligné Roni Amelan, porte-parole de l'Unesco. "Nous sommes en conséquence horrifiés". "C'était l'une des plus importantes bibliothèques de manuscrits islamiques au monde", explique Marie Rodet, qui enseigne l'histoire africaine à la prestigieuse School of Oriental and African Studies de Londres. Ces manuscrits calligraphiés et ornés de dessins ont trait à tous les savoirs - droit, sciences, astrologie, médecine, histoire et politique -, une somme de connaissances qui, de l'avis de ces chercheurs, montrent que l'Afrique peut s'enorgueillir d'une histoire écrite aussi ancienne que celle de la Renaissance en Europe. Outre son rayonnement culturel et religieux, Tombouctou fut longtemps aussi un grand carrefour commercial, sur une ancienne route de commerce traversant le Sahara et où s'échangeaient le sel, les esclaves noirs et l'or. "Le sel vient du Nord, l'or du Sud mais la parole de Dieu et les trésors de sagesse ne peuvent provenir que de Tombouctou", proclame un vieux proverbe malien datant du XVe siècle. USA - Isles of Shoals - Nathan Hamilton, associate professor of archaeology at the University of Southern Maine, said the effort began as a way to study isolated populations of marine life to learn more about invasive species and predator/prey relationships, but resulted in the discovery of thousands of relevant historical and cultural artifacts during the past several years. Aided by a team of student archaeologists from 30 academic institutions, Hamilton said they have excavated everything from animal bones, to evidence of pre- and post-Revolutionary settlements, to relics left behind by Native Americans. "We didn't expect to find an awful lot of pre-history" artifacts on Smuttynose, Hamilton said, but they in fact did locate some objects that were evidence of "fairly significant prehistoric occupation." Hamilton said evidence uncovered suggests an earlier initial occupation of the Isles of Shoals, to a time when ocean water levels were lower and the isles comprised a much larger landform. He said some arrow points and spearheads date back 6,500 years. 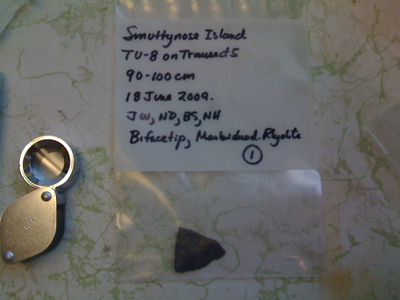 Other artifacts shed light on different epochs in the occupation of Smuttynose, including the early colonial fishing operations and the hotel era. Each square meter of excavated soil results in 12,000 to 14,000 pieces of bone and artifacts, Hamilton said. The discoveries are sometimes mundane, but shed light on the lives the fishermen who occupied the area lived. Hamilton showed slides picturing broken pieces of ceramics, while physical specimens were on hand for guests to observe after the talk. An ivory die measuring a ¼-inch long suggested the meticulous nature of excavating the site. ROYAUME UNI – Musselburgh - Archaeologists are to investigate a human skull found by council workers carrying out winter maintenance in a sand bunker by the fourth hole on Musselburgh Links Golf Course - officially the oldest golf course in the world. Officers from Lothian and Borders Police despatched the remains to Dundee University, who sent their archaeologists to look at the site. They believe the skull, which belonged to a mid-to-late teenage female (nicknamed 'Betty'), is around 2500 years old - possibly part of a Iron Age graveyard. As there is no pressing archaeological reason to remove the rest of her remains, East Lothian Council have no plans to investigate further. DANEMARK – Bronze Age - When I was an undergrad in 1990 we were taught that all six periods of the Scandinavian Bronze Age were 200 (or in one case 300) years long. The most recent radiocarbon work shows that they all had different lengths and were more likely 130-280 years long. And the periods with the most abundant metalwork finds, II and V, are the two shortest. So their previously known status as metal-rich eras looks even more pronounced now, and the intervening periods look even poorer. Per I. 1700-1500 cal BC (200 yrs) - Per. II. 1500-1330 (170 yrs) - Per. III. 1330-1100 (230 yrs) - Per. IV. 1100-950/20 (165 yrs)- Per. V. 950/20-800 (130 yrs)- Per. VI. 800-530/20 (275 yrs) . Each of these periods translates to a list of artefact and monument types that are commonly found together. Their relative ordering through time has been known since the 1880s. Current work looks at the absolute dates at which these typological laundry lists were current. It uses a new technology, radiocarbon dating of cremated bone, and new applications of Bayesian statistics, which allow us to constrain the uncertainty of the radiocarbon results using stratigraphical observations. The latter means that if we know that grave B was later than grave A because one sat on top of the other, then we can tell the software to disregard parts of the probability distributions that gainsay this observation. Hornstrup, K.M et al. 2012. A New Absolute Danish Bronze Age Chronology As Based On Radiocarbon Dating Of Cremated Bone Samples From Burials. Acta Archaeologica 83. Copenhagen. EUROPE – Patrimoine - Europe's leading heritage organisation Europa Nostra has launched today its new flagship programme ‘The 7 Most Endangered’. This programme will identify endangered monuments and sites in Europe and mobilize public and private partners on a local, national and European level to find a sustainable future for those sites. The first list of ‘The 7 Most Endangered’ will be announced during Europa Nostra’s 50th anniversary Congress in Athens on 16 June 2013. An international Advisory Panel will prepare the short list of 14 most endangered sites and the final list of 7 will be selected by the Europa Nostra Board.